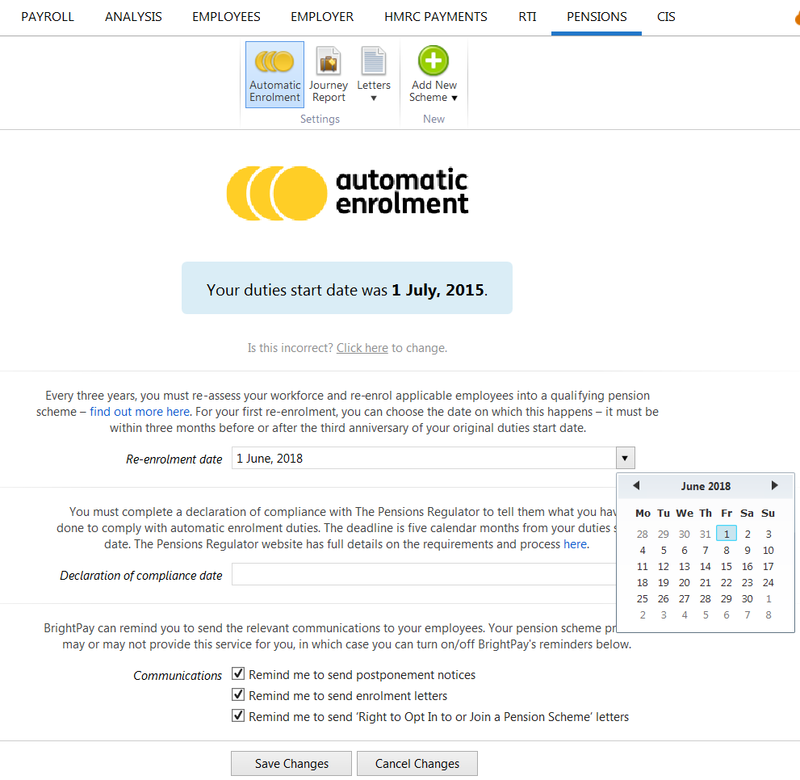 Every three years employers must put certain members of staff back into an auto enrolment pension scheme. This is called re-enrolment. Re-enrolment occurs three years after your staging date and is a legal duty whereby if you don’t act, you could be fined. Your duties will vary depending on whether you identify that you have staff to re-enrol, or whether you have no staff to re-enrol. Either way, you will need to complete a re-declaration of compliance to inform the Pensions Regulator that you have met your re-enrolment duties. The first step is to choose your re-enrolment date and this should be done as soon as possible. Your re-enrolment date is chosen by you, with a 6 month window to choose from. Therefore, you may decide to align your re-enrolment date with your other business processes such as the start of your financial year, or to avoid seasonal peaks. This window falls three months either side of the third anniversary of your staging date. Regardless of whether or not you used postponement at your staging date, re-enrolment occurs three years after your staging date, not your deferral date. Please note: the date you choose will apply to all staff i.e. you cannot use different dates for different staff members or groups of staff. It must also be noted that postponement cannot be used for re-enrolment. Once you reach your re-enrolment date, the next step is to assess your staff to establish if you need to put them back into your pension scheme. Please note: you can also choose to re-enrol various staff members, for example directors, those who are a partner in a Limited Liability Partnership, those who have left the scheme within 12 months of your re-enrolment date, and those who have given notice or been given notice of the end of their employment. It is your legal duty to write to each member of staff you have put back into your pension scheme. This must be completed within 6 weeks after your re-enrolment date. You do not have to write to staff that are not being put back into your pension scheme. Some pension providers may do this on the employer's behalf. Following re-enrolment, all employers must complete a re-declaration of compliance, even if you do not have any staff to re-enrol into your pension scheme. This is to inform the Pensions Regulator that you have completed your automatic re-enrolment duties. This must be completed within five months of the third anniversary of your automatic enrolment staging date. The Pensions Regulator website has full details on the requirements and process here . As soon as you reach your re-enrolment date in the payroll, BrightPay will automatically assess your employees for you and will determine which employees qualify for re-enrolment. 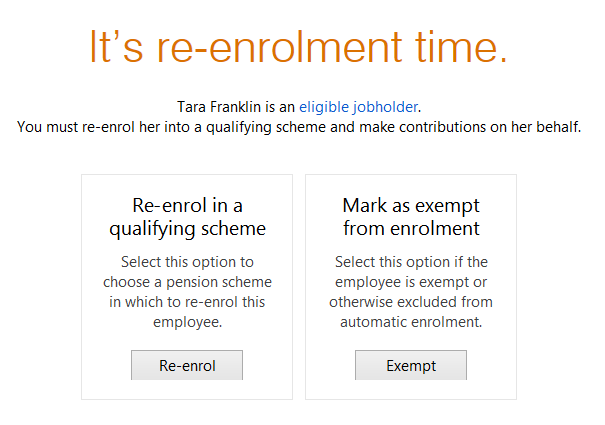 To re-enrol an eligible employee, simply select Re-enrol, followed by the pension scheme group into which the employee is being enrolled and the applicable tax relief (if unsure of the tax relief to apply, please check with your pension provider). Click Continue to re-enrol the employee selected or select 'Re-enrol multiple employees with these settings... ' to batch re-enrol employees. Please note: BrightPay's assessment of staff at the re-enrolment date takes into account the opt-out dates and cessation dates that have been entered in the software by the user. Therefore the user must ensure that the software has been instructed to know which employees have opted out or ceased active membership and that the opt-out and cessation dates entered for such employees are accurate. If no employees are flagged for re-enrolment and your automatic enrolment information for each employee is entered correctly, then this will indicate that you have no staff to re-enrol (e.g. staff members may already be enrolled, employees may not have opted out or ceased membership more than 12 months prior to the re-enrolment date). If this is the case, simply progress to step 4 - completing your Re-declaration of Compliance. For each employee you re-enrol, you must provide them with an enrolment letter within the 6-week period after your re-enrolment date. BrightPay will automatically prepare this letter for you, which can be printed, exported to PDF or emailed to the employee. Please note: you do not have to write to staff that are not being put back into your pension scheme. Following re-enrolment, you must complete a re-declaration of compliance within five months of the third anniversary of your automatic enrolment staging date, regardless of whether you have had any re-enrolment duties to perform. Please note: your re-declaration of compliance deadline does not change according to the re-enrolment date you have chosen. This is an online form which is to be completed through The Pensions Regulator website and its purpose is to inform The Pensions Regulator that you have completed your automatic re-enrolment duties. The Pensions Regulator website has full details on the requirements and process here .